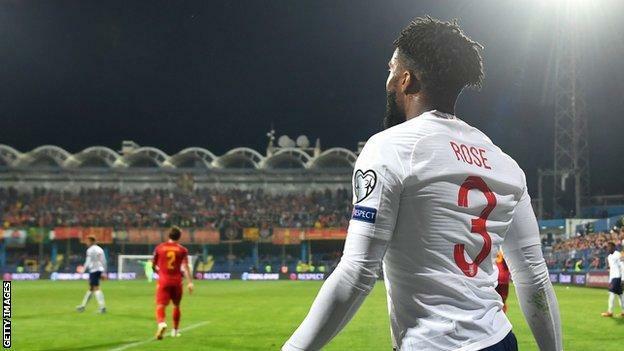 Danny Rose made his England debut in 2016 and has 26 capsTottenham defender Danny Rose says he "can't wait to see the back of football" and is frustrated at the lack of action taken against fans' racism.Racist chanting was directed at several England players, including Rose, during the Euro 2020 qualifier in Montenegro.Uefa has charged Montenegro with racist behaviour but Rose, 28, does not expect a significant punishment. Rose, who was also abused while on England Under-21 duty in Serbia in 2012, says he will play on but has "had enough" of racism in the game. "How I programme myself is that I think I've got five or six more years left in football, and I just can't wait to see the back of it," he added. "Seeing how things are done in the game at the minute, you just have to get on with it. "There is so much politics in football. I can't wait to see the back of it. "The Montenegro disciplinary case will be dealt with by European football's governing body on 16 May.The minimum punishment is a partial stadium closure, while a second offence results in one match being played behind closed doors and a fine of 50,000 euros (£42,500).Montenegro coach Ljubisa Tumbakovic said he did not "hear or notice any" racist abuse, but England manager Gareth Southgate said "there's no doubt in my mind it happened - it's unacceptable".Rose said he had been ready for more chanting in Podgorica last week but does not expect the situation to change any time soon.This week, Juventus' 19-year-old Italian forward Moise Kean suffered racist abuse from the stands during a match at Cagliari - with team-mate Leonardo Bonucci's suggestion that Kean was partly to blame called laughable by Rose's England team-mate Raheem Sterling.Manchester City's Sterling was himself allegedly abused at Chelsea in December, while Uefa is investigating an case of alleged racist abuse towards another England player, Callum Hudson-Odoi, during Chelsea's Europa League win at Dynamo Kiev on 14 March. How have Italian media reacted to Kean incident? Uefa president Aleksander Ceferin has said he will ask referees to be "brave" and stop matches when there is racial abuse from supporters, but Rose says he just wanted to get the win and get home from Montenegro. "Gareth Southgate was a bit upset after the game because it was the first time he'd been involved in something like that. He didn't know what the right course of action was," said Rose. "He said he was fully behind me if I wanted to walk off. I appreciate that, but I just wanted to get the three points and get out of there as quickly as possible. "Obviously it is sad that I had to prepare for that, but when countries only get fined what I probably spend on a night out in London then what do you expect? "You see my manager [at Tottenham, Mauricio Pochettino] get banned for two games for just being confrontational against [referee] Mike Dean at Burnley - but a country can only get fined a little bit of money for being racist. It's a bit of a farce. "So that's where we're at now in football. Until there's a harsh punishment, there's not much else we can expect." » Quiz: Can you name everyone who played for England in 2018?